This is not the way to start a piece that you want people to keep on reading. Intros are meant to engage the reader, draw them in, intrigue them or at least inform them, keep them wanting more, keen to read on. If I tell you that this shows every sign of being about me, me, me (what do you mean, what’s different from every other week! ), you can move on to something else with a clear conscience, no offence taken. 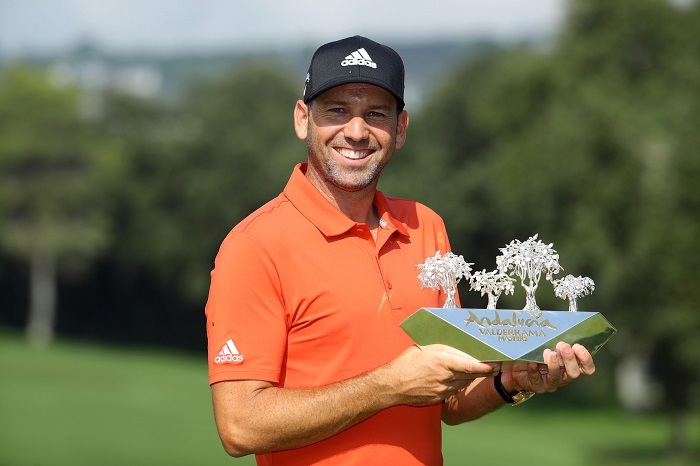 I was delighted to see that on Monday defending champion Sergio Garcia hung on to win the weather-disrupted Andalucia Valderrama Masters, hosted by the Sergio Garcia Foundation, at Real Club Valderrama. 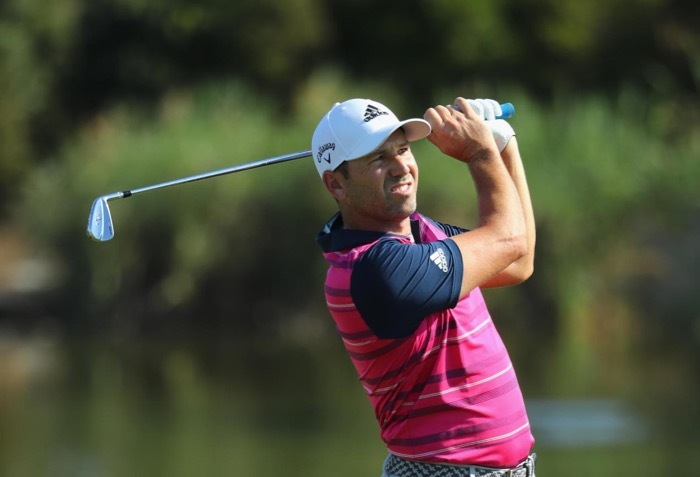 The event was reduced to 54 holes – it does rain in Spain – but Sergio coped well and won by four shots from Shane Lowry (hooray), who finished with a 66. I’m a Sergio fan still and am happy to take every opportunity to show him, beaming, clutching a trophy. Shane, I hope, will be winning more trophies soon. Sergio happy to have Valderrama’s cork trees just where he wants them. 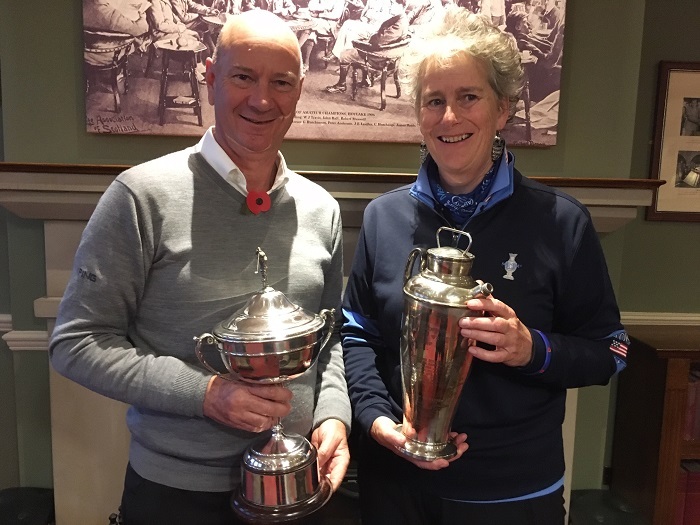 On Monday I was playing at Delamere Forest in Cheshire, which is always a treat to play, not, for once, with Maureen, who is a member there (hooray) but with the AGW (Association of Golf Writers), contesting the Michael Williams Hogget. 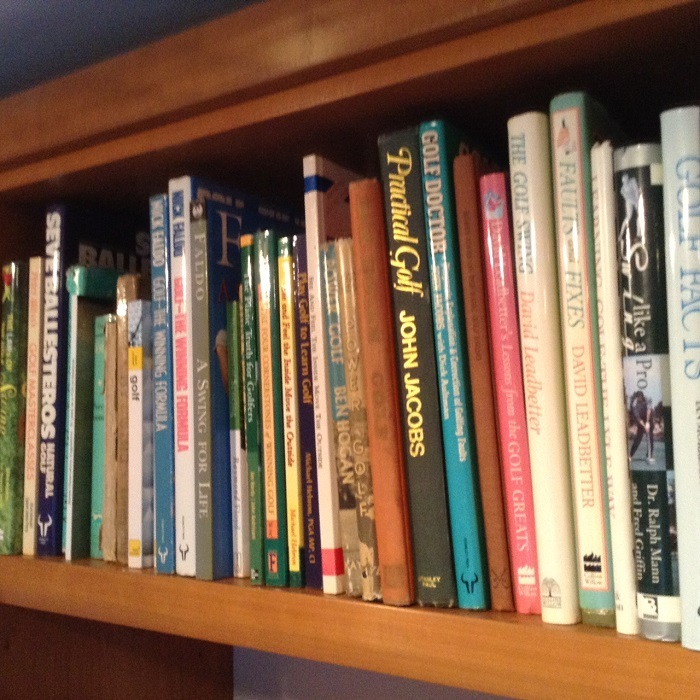 Michael, who died, far too early, on his home course of Chelmsford, was the golf correspondent of the Daily Telegraph for many years but I had to look up hogget in my trusty Chambers Dictionary and am now, I confess, none the wiser. A hogget is, apparently, “a yearling sheep or colt”, so who knows what it has to do with Michael or golf. I await the answer with some trepidation. Rob Perkins, who’d travelled up from Somerset, claimed the title and pretty well wrapped up our Race To Wentworth and the Etiqus Golfer Of The Year award with only the AGW Championship, at Hoylake, to come. No longer required to be hot on detail, I believe he could have given Royal Liverpool a miss and gone home and still come out as No 1. Rob Perkins (left), AGW No 1 after a stellar season, with yours truly clutching the Fred Pignon Trophy for a record-breaking fourth time. 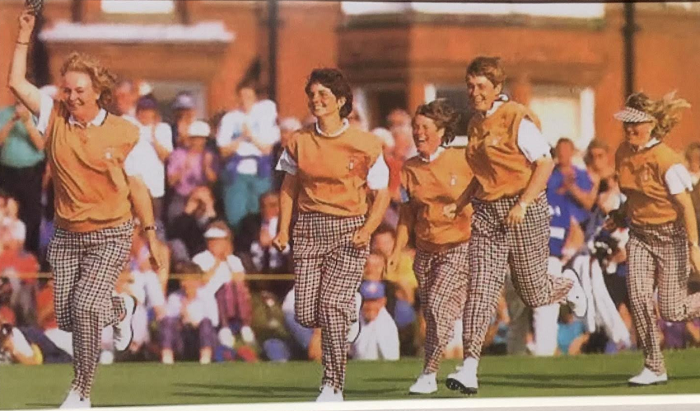 I’ve always liked Hoylake – even when there were places where women could not tread in a clubhouse that is a treat in itself, full of photographs and portraits that could keep you engrossed for days. On Tuesday, it was too tough for the likes of me, blowing a hooley that might have been stronger than the one at Royal St George’s when Darren Clarke won the Open Championship. On the 1st tee I thought that amassing double figures in points for the 18 holes would be a good effort. I’m not joking; it was that windy. One thing that Hoylake lacks is one of those wind thingys (have forgotten its official name) that tells you just what you’re having to cope with – zephyr, storm, gale, hurricane, whatever. The club history is called “Mighty Winds … Mighty Champions”. GB and I’s nail-biting Curtis Cup triumph at Hoylake. There’s nothing quite like winning in a team. From left to right: captain Liz Boatman, Joanne Morley, Vicki Thomas, Julie Hall (nee Wade, now Otto), and ? Was going to say Caroline Hall but think she was on the 18th clinching victory! We could just about stand up, so it probably didn’t quite reach gale force, though some of the gusts might have – my trolley blew over four times – and I clocked up nearly 19,000 steps (about 11 kilometres), tracking balls that were blown to blazes as they soared in the wrong direction; at Delamere it was 16,000. I managed 11 points going out (hooray) and wondered why I couldn’t see properly before realising that salt blown in from the Dee Estuary was mucking up my glasses. Regrouping and drawing on my formative years at Portstewart and Portrush , I amassed 17 points, little short of miraculous, on the back nine, including one blob, at the 15th. It was into the teeth of the wind, I didn’t have a shot and knew I was toast when I put my second shot into a fairway bunker. Don’t think I ever got out. So now I know why Tiger went to such great lengths to stay out of the buggers when he won the Open so emotionally in 2006. Anyone who thinks he found it easy-peasy didn’t see him fall into Steve Williams’s arms when the last putt went in. Tiger, whose dad had died earlier that year, was a man who’d put every last ounce of skill, effort and emotion into every shot. He’d given his all. Easy it was not. My three partners and I staggered in as darkness was falling and it turned out that my valiant total of 28 points had won by four points. So I became the first person to win the AGW Championship and the coveted Fred Pignon Trophy four times! Even more amazing, this victory came 27 years after my first triumph and 16 years after my third (hooray)! Finished at last, my partners blown to blazes. Hard to show wind in a pic but the flag is a clue. I couldn’t help thinking about my first win, way back in 1991, at The Wisley. Foolishly, because the club handbook recommended that only single figure players should attempt the course from the back tees, the men played off the tips – and the golf writers, for all their qualities, are not, in the main, even in their dreams, frustrated tour pros. 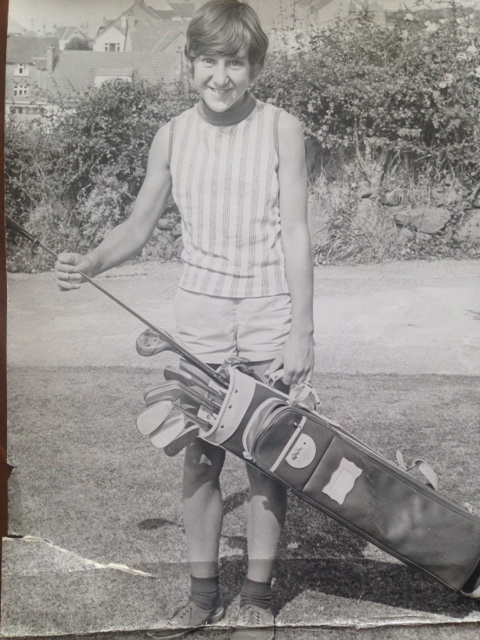 I, the only woman, played off the red tees, which we sometimes couldn’t find because they’d been plonked so far up the fairways. My course, as it turned out, was 1,000 yards shorter than the men’s, which, even allowing for everything you could allow for, was pretty daft. Anyway, I blobbed the 1st and the 18th and came in with 38 points just as husband Dai was being hailed as the champion. He’d played out of his socks, spikes, everything and come in with 36 points, a magnificent effort deserving of the trophy and a first victory in the championship. And I snatched it from him. It would not be an understatement to say that my reception (not just from my ever-lovin’) was glacial – and this was long before we were taking global warming seriously. It was COLD. The following year, at Brocket Hall (some things stick in your mind), Liz Kahn and I were made to play off the same tees as the men, with a few extra shots thrown in as some sort of inadequate sop. Our protests came to nothing, especially when Liz finished respectably in the middle of the pack and I won, again. Oops – or do I mean hooray! 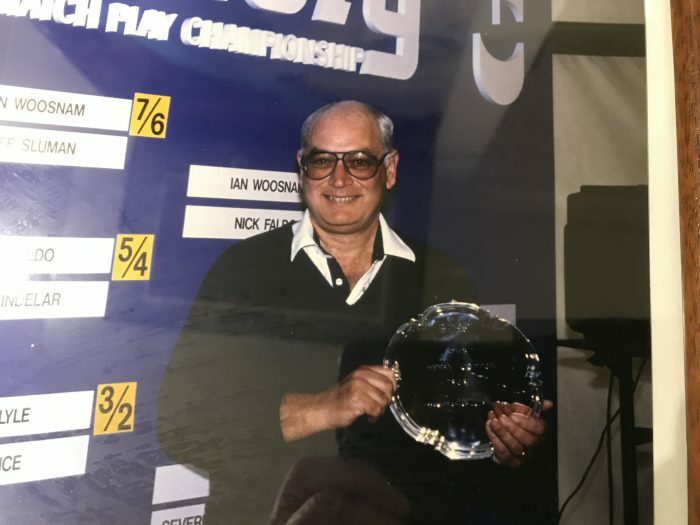 Sorry Dai, you probably did deserve to win at The Wisley and at least you once got your hands on the original Henry Cotton Salver, the solid silver one that is now at the bottom of the Thames – but that’s a story for another day. 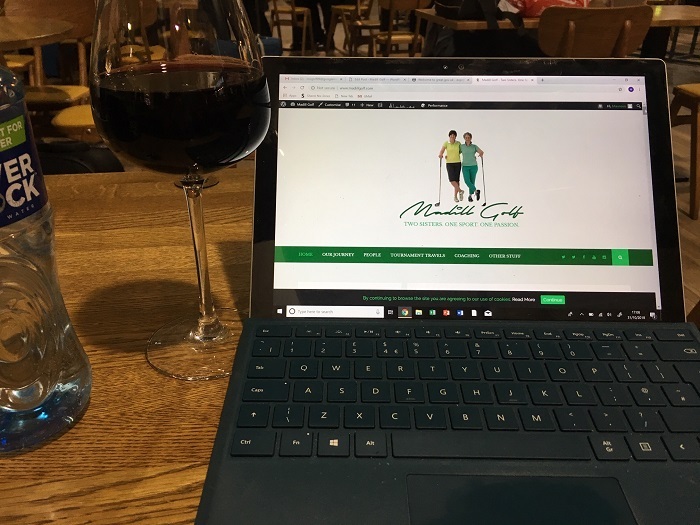 We don’t have long to save the planet, so it behoves us golfers, irrespective of whether we have children or grandchildren, to do our bit, don’t you think? The other evening I caught the tail end of a programme about the damage that fashion – yes, clothes, shoes, the sort of thing all of us wear every day – does to the environment. Setting aside the exploitation of many of the people who work long hours in rubbish conditions for very little pay so that we can buy tee shirts for tuppence halfpenny (or fippence, as my Spiddle-born Galway granny used to say, well ahead of decimalisation), it’s the tsunamis of water used in the making of garments, the grunge from the dyes discharged into rivers that turn into death traps rather than life-savers that pollute more than almost anything else. Fracking? Not in the same league. Coal? Ditto. You get the picture. 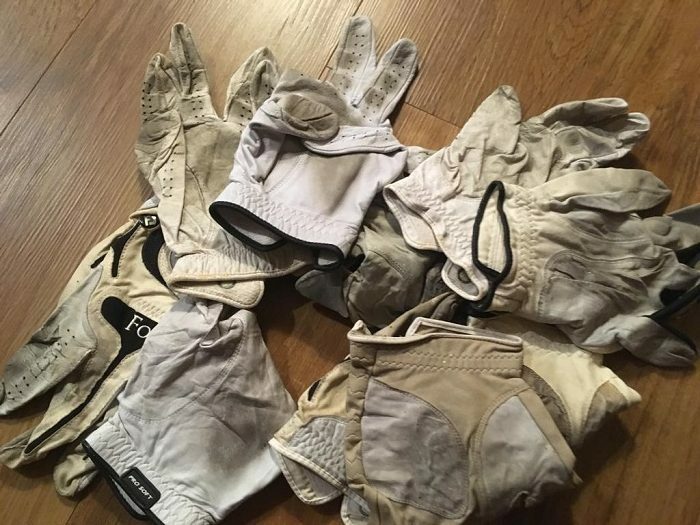 A sample of one man’s golf gloves. A future art installation perhaps? For instance, have you ever given a single solitary thought to the provenance of your golf glove? No, neither had I. And that’s not just because it’s many years since I’ve worn one. That was not a case of social conscience, more lack of funds allied to congenital meanness, big hands and a dodgy grip (despite the best efforts of some very sound teachers). It was hard to find one that fitted properly, they didn’t last long and they cost a lot. I moved onto Elastoplast (think that probably needs a trademark sign despite having achieved the status of a generic term for plasters), then gave that up and relied on skin and battled through the pain of the odd blister. As usual I digress. It may be different now but at one time, not so long ago, a leather glove’s life started in Africa, on the stomach of a young goat – yes, a kid, a mere baby – before being shipped to the creme de la creme of tanners in Somerset; then it travelled to Taiwan, to be stitched by nimble-fingered seamstresses, perhaps with state-of-the-art machinery; after that it was off to the United States (it was the days when they always won the Ryder Cup, so they were probably great), where it was packaged and shipped off across the world to wherever, including your own professional’s shop, should you deign to support her or him – cheaper from the high street golf shops perhaps or tax giants like Amazon. That got me thinking about that magic material Gortex and all the wonderful, easy, stretchy things we wear nowadays as a matter of course. Those things that mean I don’t have to own an iron or ironing board. How are they made? What damage do they do? Does that make us all culpable? Guilty of turning a blind eye to our part in buggering up the planet? How many millions of us are there? If we all did one little tiny thing to change, we’d make a difference, if we all made the same tiny little change at the same time, we’d be dangerous! Not quite Strictly but dancing is for everyone. I used to think that I wouldn’t mind if Florida, which is only a few feet above sea level after all, sank but then, as it started being battered by storms, I started to think about all the friends I had who lived there and I realised that, selfish git though I was, Florida mattered to me. Admittedly, I cared more about my friends and the manatees than the golf courses but the health of Florida is important to the health of the planet and the more Floridians who wake up to that fact the better. The golf courses, sensitively and ecologically managed, could be a big force for good. And I think that goes for everywhere in the world. It’s a bit scary to think that what we do, every single one of us, makes any difference whatsoever but, inescapably, it does, we do. Can we cope with the responsibility? This week, on a less global note, the redoubtable women of WHGC (Whittington Heath GC) took on the seniors in our annual match. As usual, we lost, but this time only narrowly 3 1/2 – 4 1/2. Seniors are sensitive souls – I suspect it comes with age – so we don’t like to beat them up too badly, if at all. We’ve now got a very equitable format – stableford match play, with the men playing off their card and we women playing off our stroke index. As a rule it makes for close, competitive matches. My partner and I won on the 18th – she holed a bit of a monster putt to win the 16th to get us back to all square and then won the last, where she had a shot, with an immaculate par, for three points. 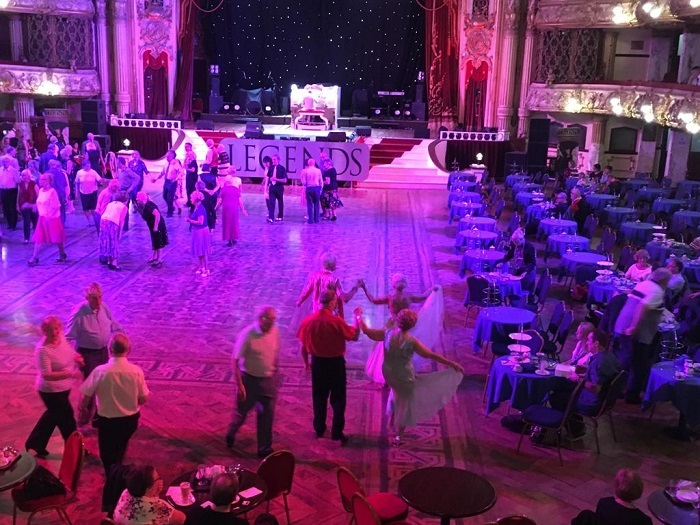 The next day we were off in a coach, to Blackpool, for a tea dance at the legendary Tower Ballroom, the mecca of ballroom dancing. It was brill. It was just wonderful to see so many people of all ages and stages swirling around with a smile on their face, loving every minute. My partner and I, who must still rank as 35-handicappers at best, can now say that our dance shoes have set foot on one of the most hallowed floors in the world – think St Andrews, Augusta National, Royal Melbourne. 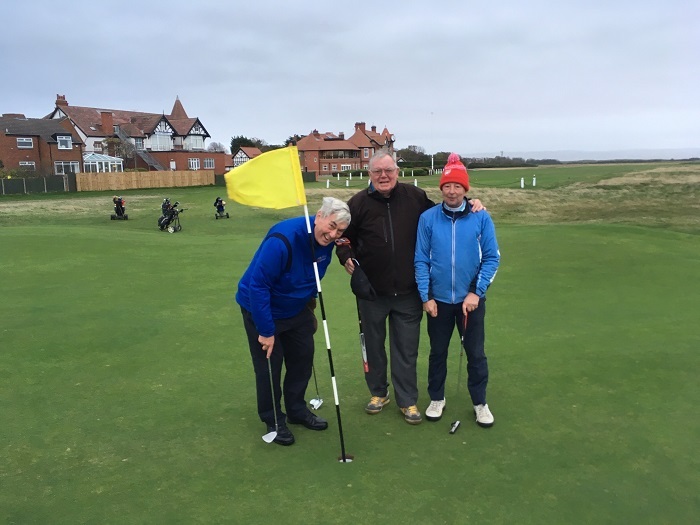 And the good thing about Blackpool is we didn’t take any divots….. 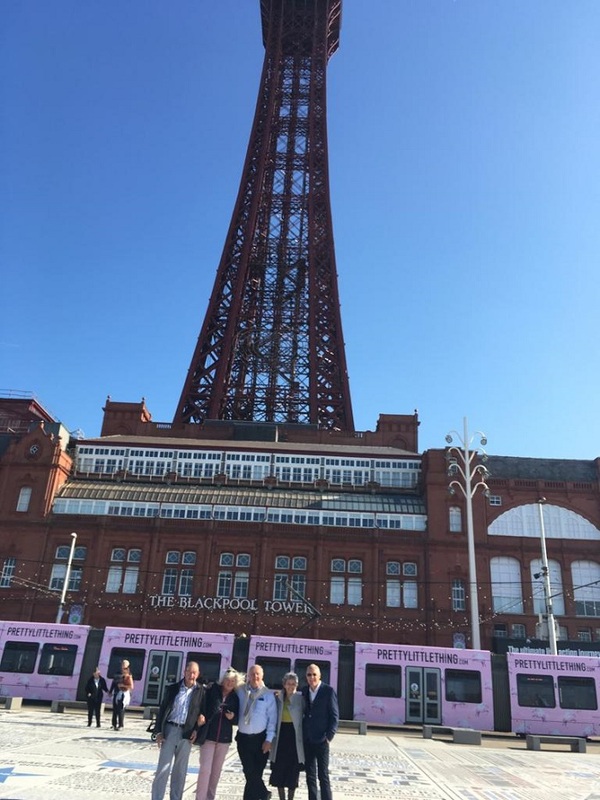 Inspired by the Eiffel Tower but pas Paris: tripping the light fantastic in Blackpool. The spare bedroom, which will be in use in a few days’ time, has become my packing ground as I prepare for the Ryder Cup in Paris – and panic is already setting in, not least because there’s a danger of a semblance of organisation ruling in the Davies household. Too much probably? Don’t suppose the players have to do any packing at all, just have to look at the list for the vetements du jour. The last time I took this much care over my packing I was nearly arrested. Dai and I were going to Australia and environs for eight weeks, so I took a week to decide what I was taking with me, operating on Dai’s principle that you only needed to pack for a week however long the trip was. I was chuffed with the results – 12.5 kilos in a not-even-full bright yellow Kipling bag. That’s right 12.5 kilos including the bag. Brill, I thought as I checked in. How long did you say you were going for the check-in woman said. Eight weeks I said, proudly, oblivious to the disbelieving, nay, suspicious look on her face. Later, as I presented my boarding card, I was taken to one side by a couple of men with stern expressions. Special Branch? Who knows, something similar anyway. Having Belfast as my place of birth probably didn’t help but I was a bit, as my mother would NEVER have said, affronted. It’s taken me years of practice as well as a week of assiduous mixing and matching to get to this point I protested. Plus a much-travelled husband with his 7-day rule. In the end, they laughed and let me go. The bag weighed a lot more coming back. 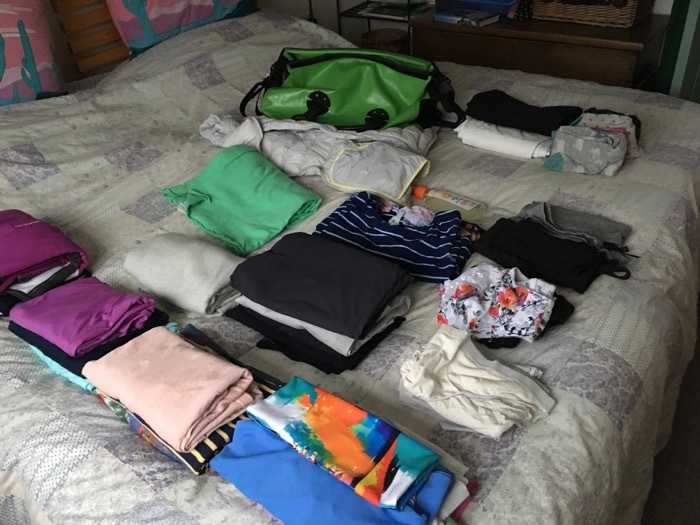 Packing for Paris always does my head in – or it used to until I caught myself on. It’s Paris, for God’s sake Patricia, you haven’t a hope; it’s full of Parisians, elegant, stylish creatures since they emerged from the womb – or wherever babies come from these days; you’ll never be mistaken for a French person, let alone a Parisian woman of lots more than a certain age, so STOP WORRYING! Phew. Great pep talk. I can relax and pack the waterproofs and the bobbly purple fleece from the 2011 Solheim Cup. It’ll be chilly in the mornings, though Mo tells me it’ll be warm for the match days next weekend, with no rain forecast. Huh. I’ll believe that when the first of October comes and my waterproofs are packed away dry – apart from the odd damp patch from Europe’s celebratory champagne spray!!? – ready for the flight home. 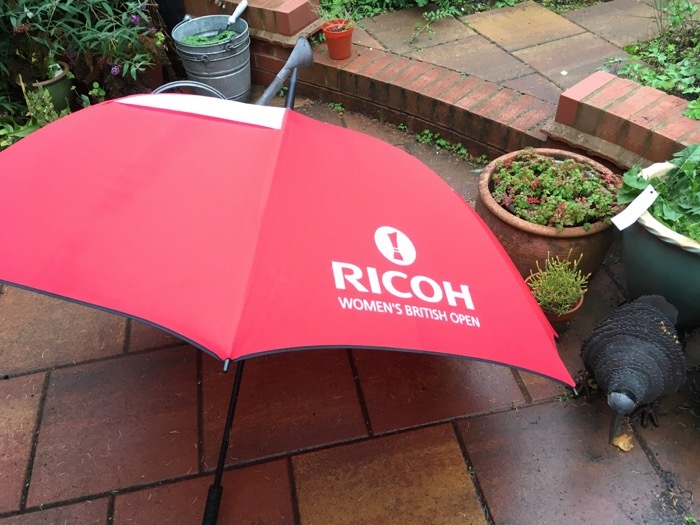 Don’t think the Ricoh brolly will make it – too big – but can you spend a whole week in Paris in September without getting wet? The last two home Ryder Cups I was at I lived in my waterproofs. To my horror, I realised they were way back in 2006 and 2010. The K Club was wet, wet, wet, not just from torrential rain but awash with tears as everyone tried to cope with the death of Heather Clarke, Darren’s wife, far too young, from cancer. Funnily enough, I scarcely remember the rain and mud, though I know that the waterproofs – bright red (well Woosie, claimed by Wales, was the captain) – went on first thing in the morning and didn’t come off until we got home at night. Every day. It was much the same at Celtic Manor four years later when my very expensive Dubarry boots proved themselves worth every penny within 24 hours. Trainers and anything ankle length were liable to be sucked off into the mud, so knee high was the way to go. Mo wore the Dubarrys at Gleneagles and I’m thinking I might need them in Paris, fair forecast or not. Cost per wearing after all these years of service? Minuscule. Let’s hope Europe don’t need bad weather to win. There was torrential rain here today, with our friendly match against Sutton Coldfield cancelled, the course flooding and the American Circus big top in Beacon Park, near me, being battered by audience-deterring downpours. It seemed to be sunny at the Portugal Masters in Vilamoura, with players in their shirt sleeves as they enjoyed a low-scoring day on the Dom Pedro Victoria Golf Course. Sergio, who might not have made my team for the Ryder Cup circus at Le Golf National, had a 66, five under par, three shots behind the leader Lucas Herbert, an Australian. Thorbjorn Olesen, the Dane who’ll make his Ryder Cup debut next week, started with a 68. Fingers crossed he and Sergio will be at the top of their game when it really matters…. 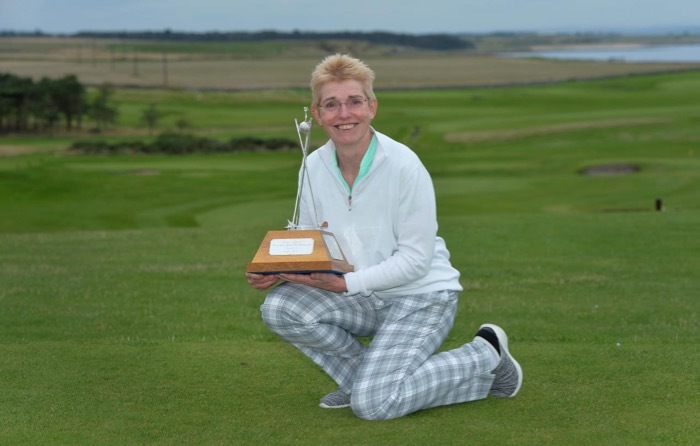 One woman who was on top form in testing conditions at Crail, in Fife, was Laura Webb (nee Bolton), who’s just won the Women’s Senior Amateur Championship for the second time in three years. She had rounds of 67 and 73 for a 4 under par total of 140, nine shots ahead of Sale’s Catherine Rawthore. Webb now plays out of East Berkshire but she grew up at Cairndhu in Larne and also played a lot of her golf at Royal Portrush, so she knows about bad weather. Well done Laura, class is permanent. 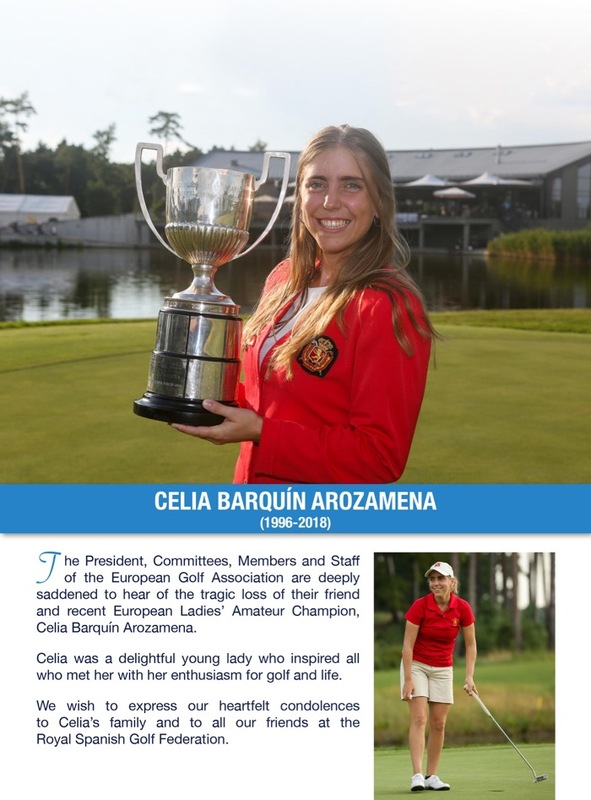 I hate to finish on a sad note and this could not be sadder but I can’t not mention the tragic death of Celia Barquin Arozamena (1996-2018), who was murdered on a golf course not far from the Iowa State University campus where she was finishing her degree in civil engineering. The Spaniard, who had been named Iowa State’s Female Athlete of the Year, also won the European Ladies’ Amateur Championship in Slovakia in July. There are plenty of words that come to mind – heartbreaking, sickening, senseless – but at the moment they’re all inadequate. Love and hugs to Celia’s family and friends.